PrimeLocTM Packaging strives to develop and deliver the best taping equipment in the industry. Our ongoing commitment to innovation and to quality design, manufacturing, and testing ensures that our products will exceed your expectations. Each of our tape applicators has been individually inspected against our high standard of quality. 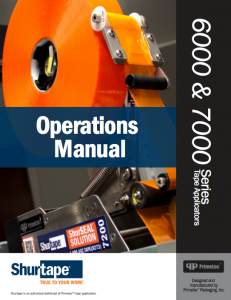 This manual explains how to handle, operate, and maintain your tape applicator. Please ensure that all operators have read and understood the instructions in this manual prior to using or maintaining the applicator. Note that the illustrations provided may differ from your tape applicator, as there are multiple base configurations and optional add-ons available. Is your current packaging line negatively impacting your bottom line? What does it mean for packaging tape to “hold strong”? Case Sealing Chargebacks Hitting Your Bottom Line?